Never Before Offered For Sale. 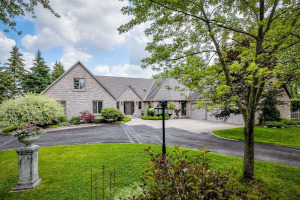 This Breathtaking Custom Built Mansion With Over 5200 Luxurious Nested On A Half An Acre. 6 Bedrooms, 6 Bathrooms. Main Floor For Entertaining And Family, Spacious Kitchen With Fire Place, Centre Island, Breakfast Area And Walkout To Patio. Main Floor Bedroom With En Suit Is Idea For In-Law Or Guest. All Elf's, Fridge, B/I Stove, B/I Microwave And Oven. Washer+Dryer,Gas Fireplace, 2-Sump Pumps. Cctv Camera, In-House Audio System, Water Softener Long Private Drive With 10-Car Parking. Incredible Opportunity.